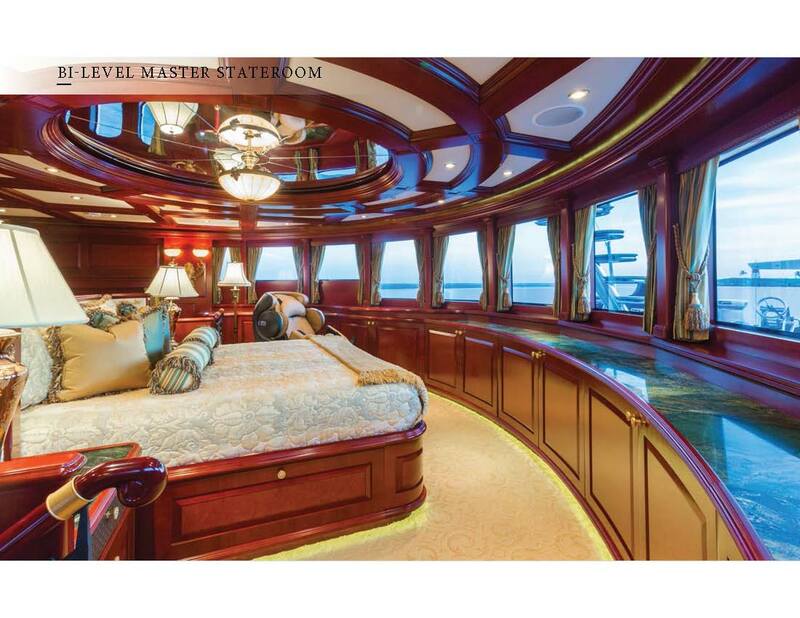 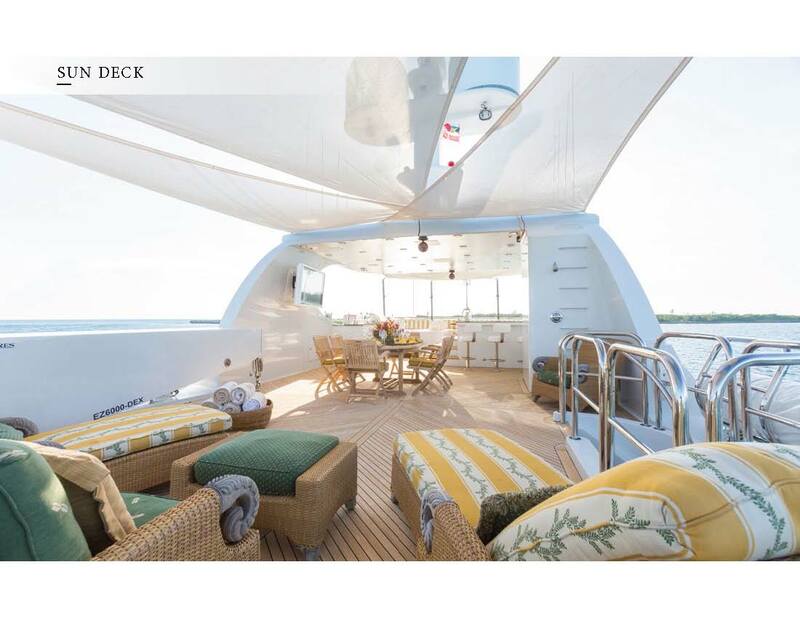 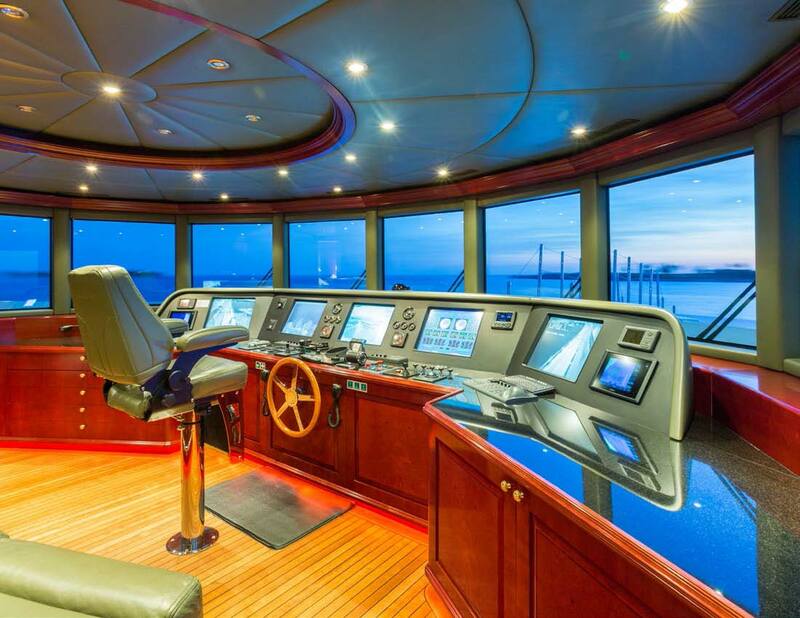 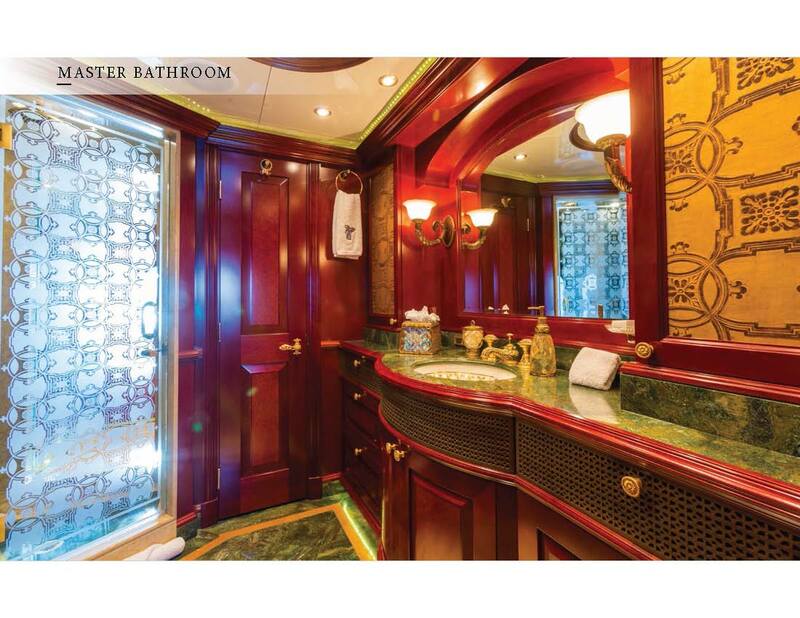 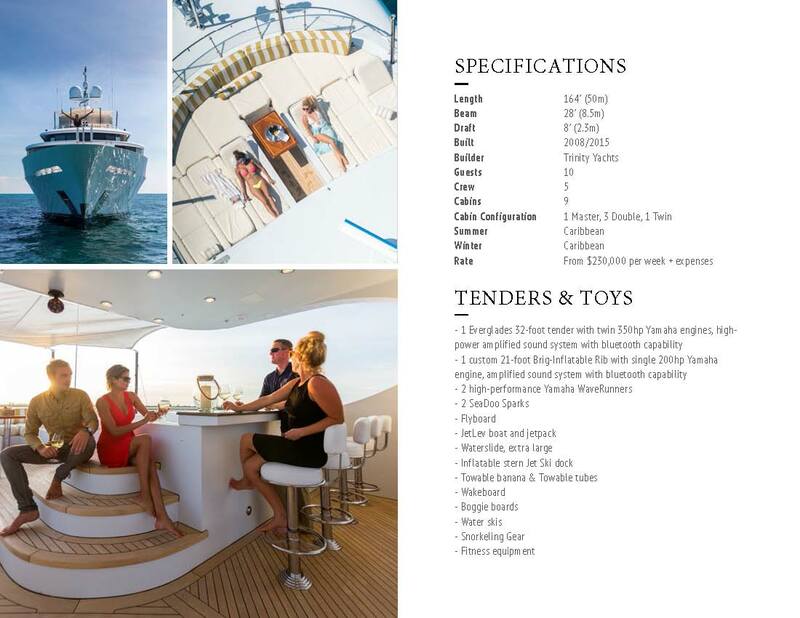 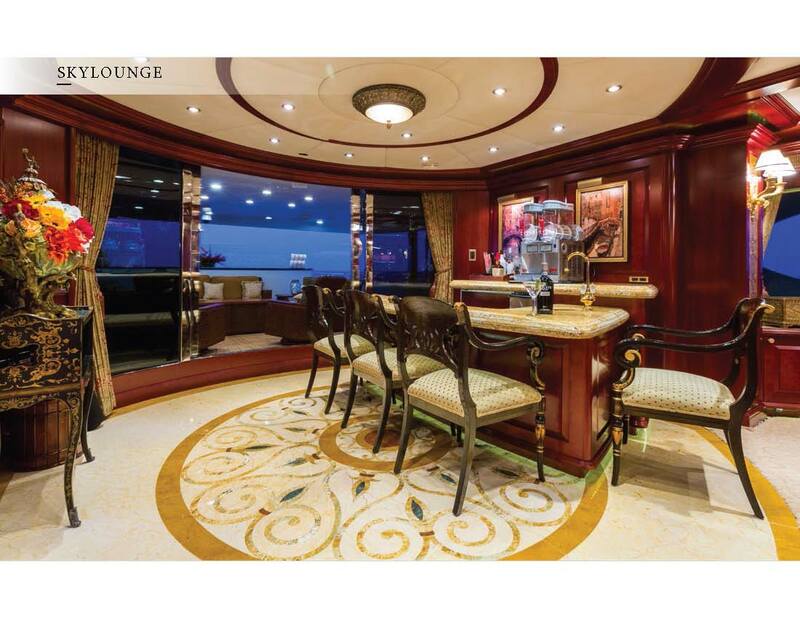 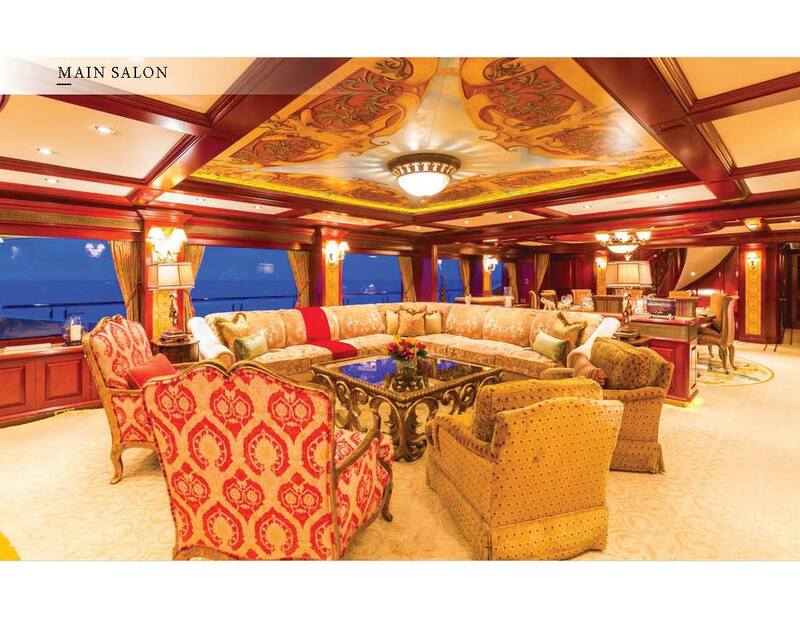 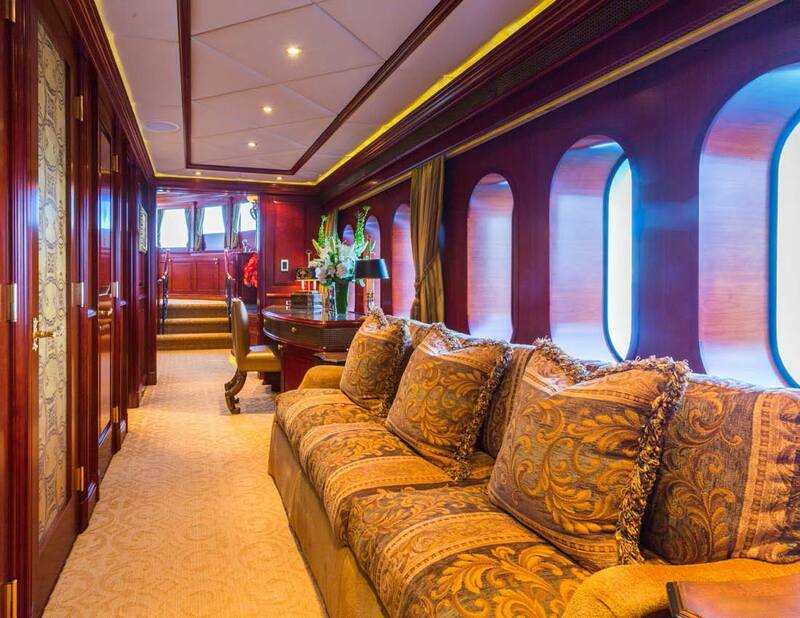 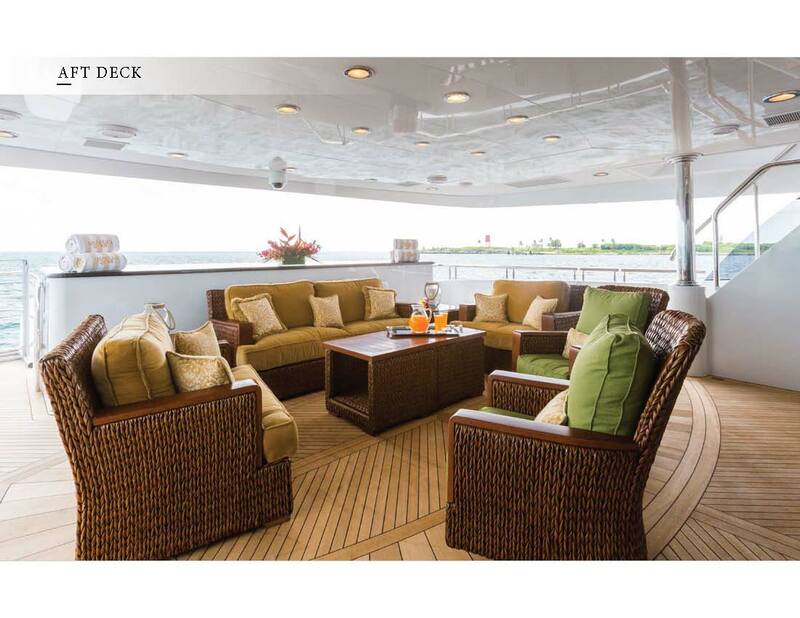 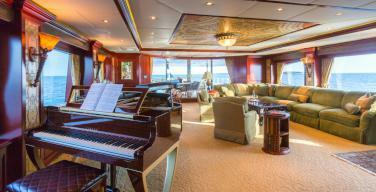 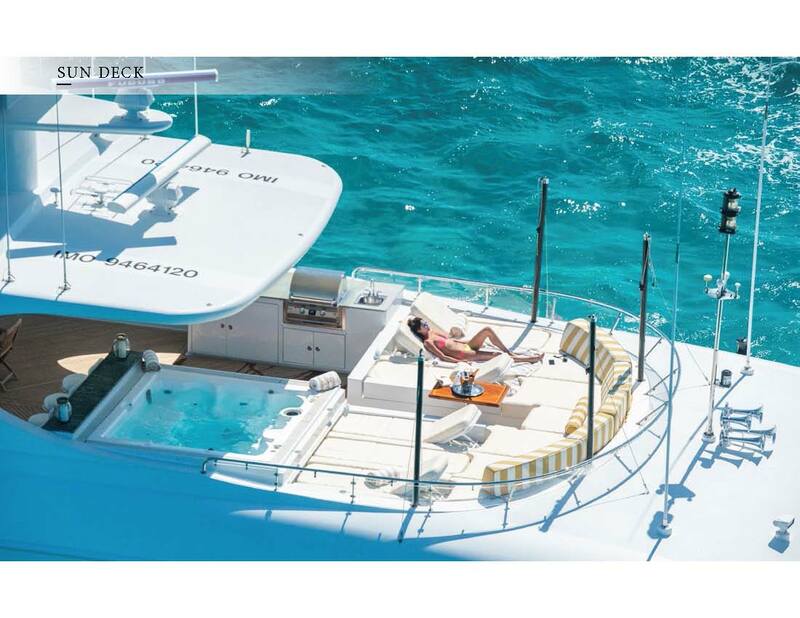 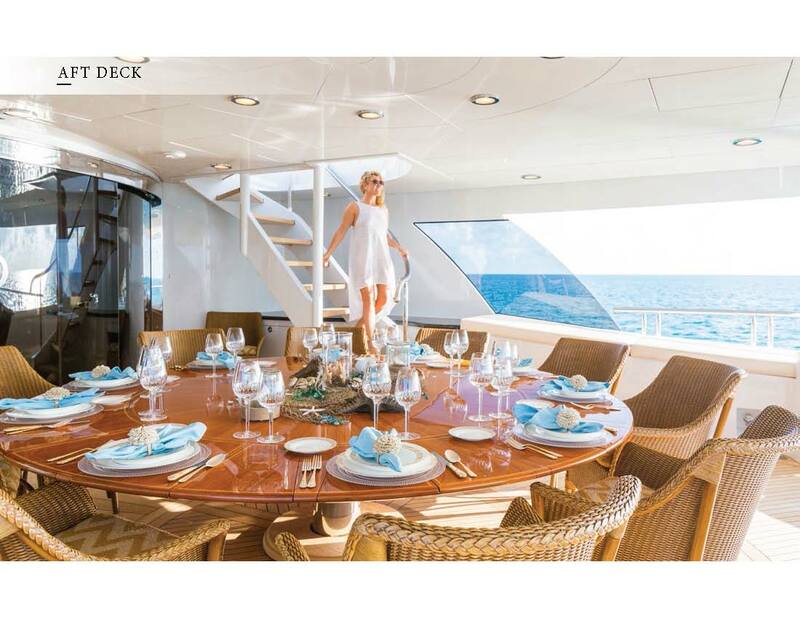 Main Deck Master King + 3 King + 1 Twin with Pullman, each with private bathroom. 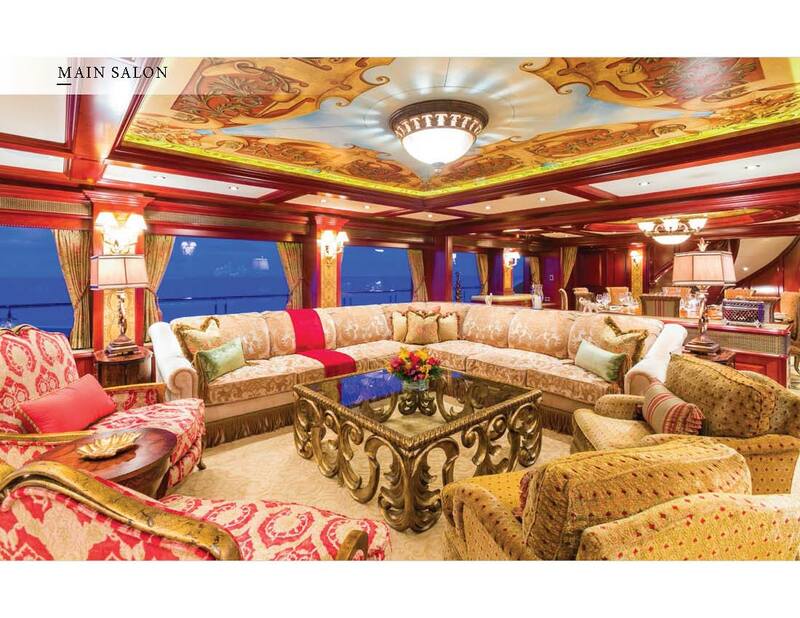 Presently available in the Bahamas, the 164’ Trinity (USA) motor yacht, AMARULA SUN, has rich Victorian appointments in red, yellow, and green velvets and velour’s with tassels and brocades that are absolutely stunning. 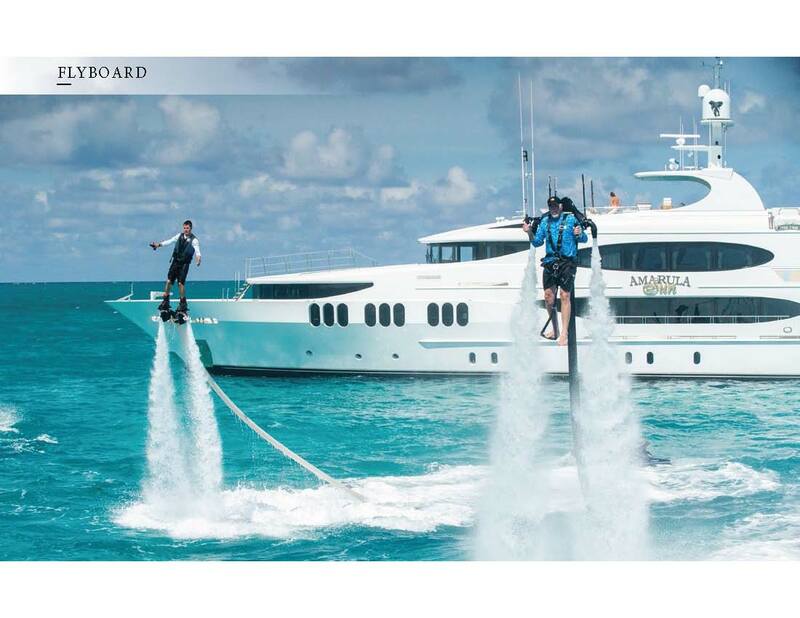 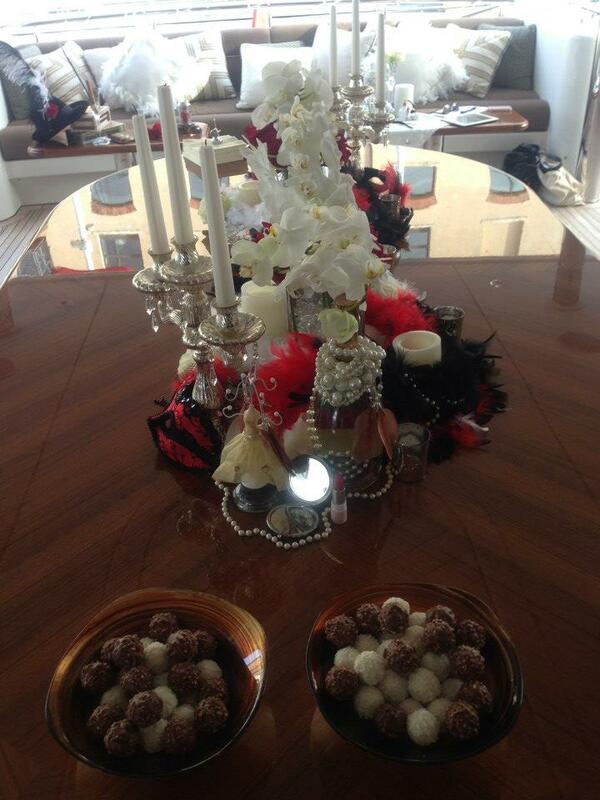 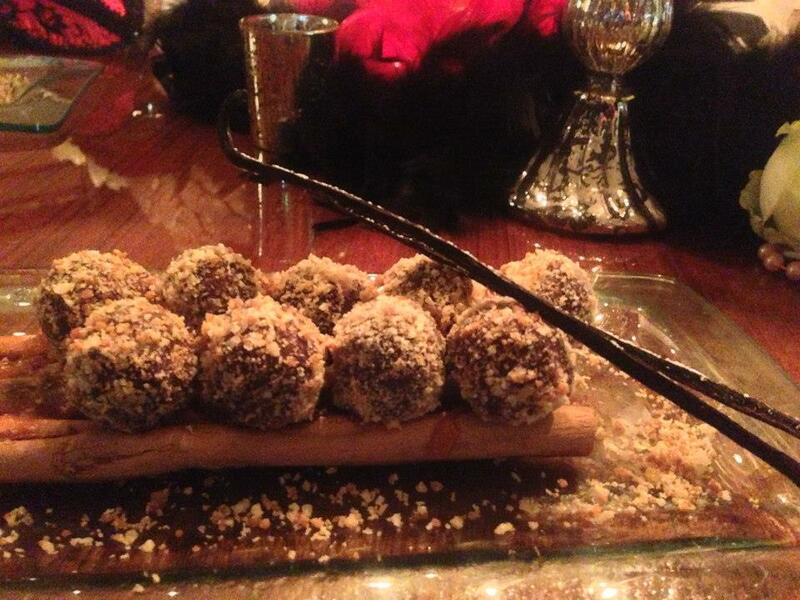 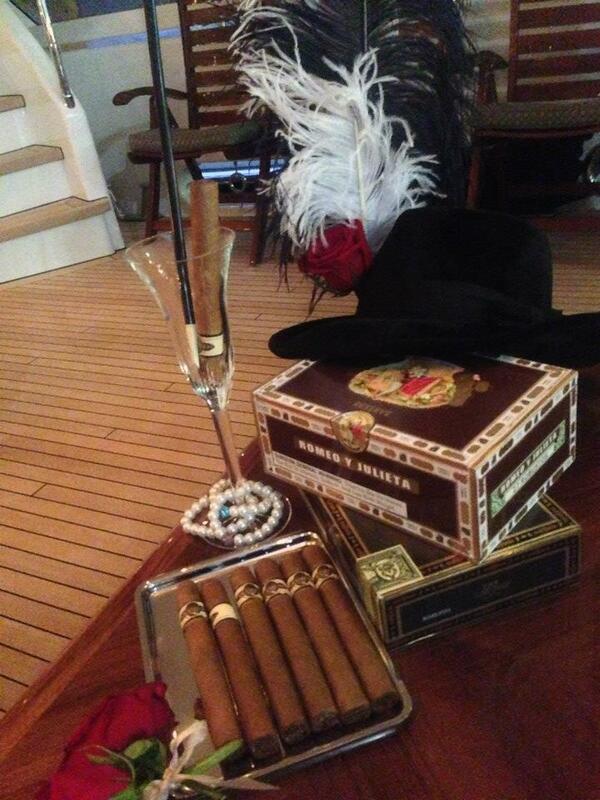 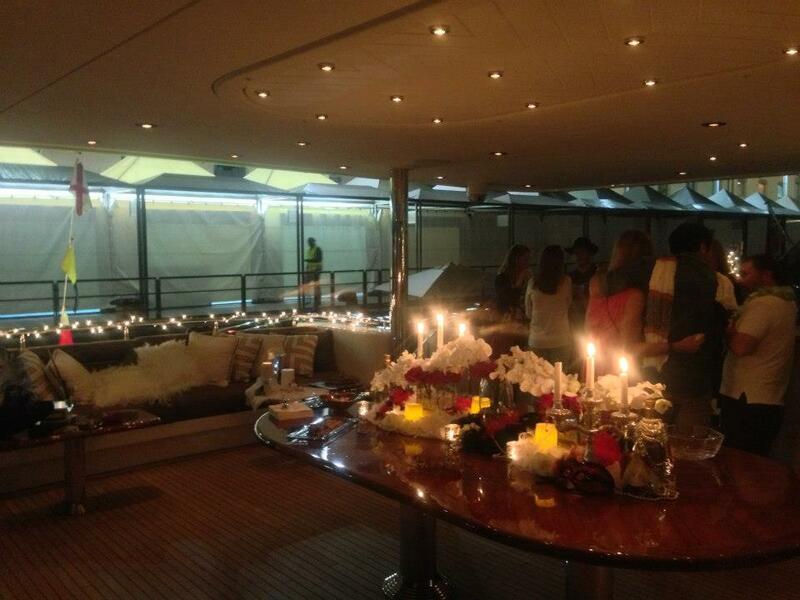 When entertaining, the crew have been inspired to throw Twenties parties in keeping with the style of the boat. 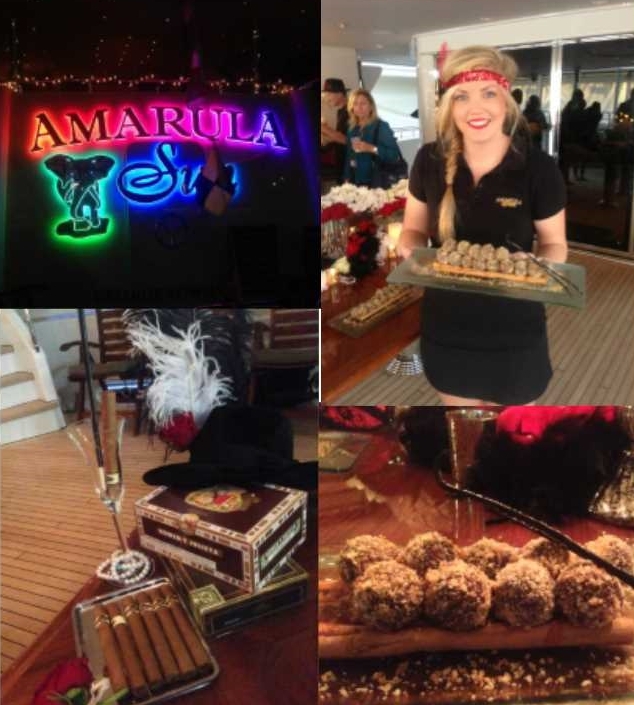 At the same time, the crew dress the sumptuous dining tables with bottles of AMARULA liqueur, leaving one to believe there might be some connection between the owner and this famous South African liqueur – hence the name of the yacht… The velvet fabrics are rich and bright and warm and new all at once. 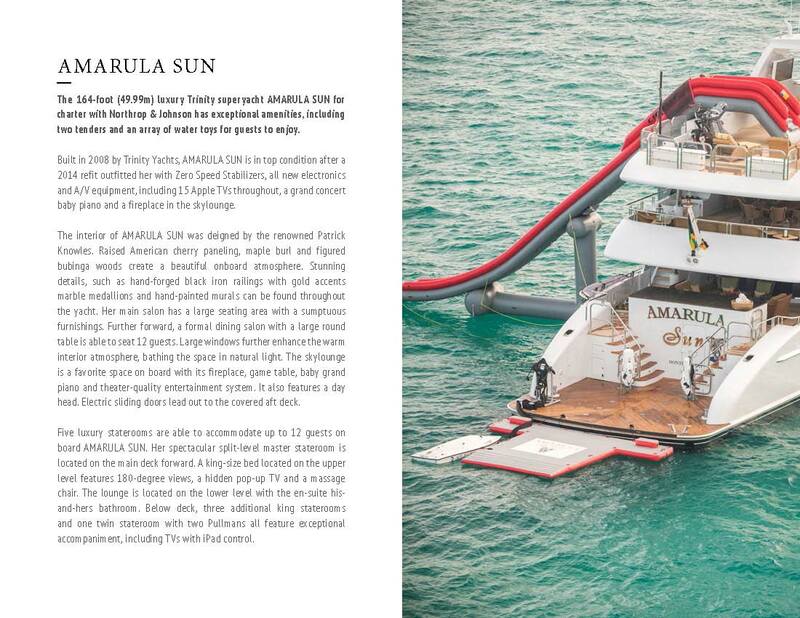 AMARULA SUN is a fun boat, and certainly a comfortable one. 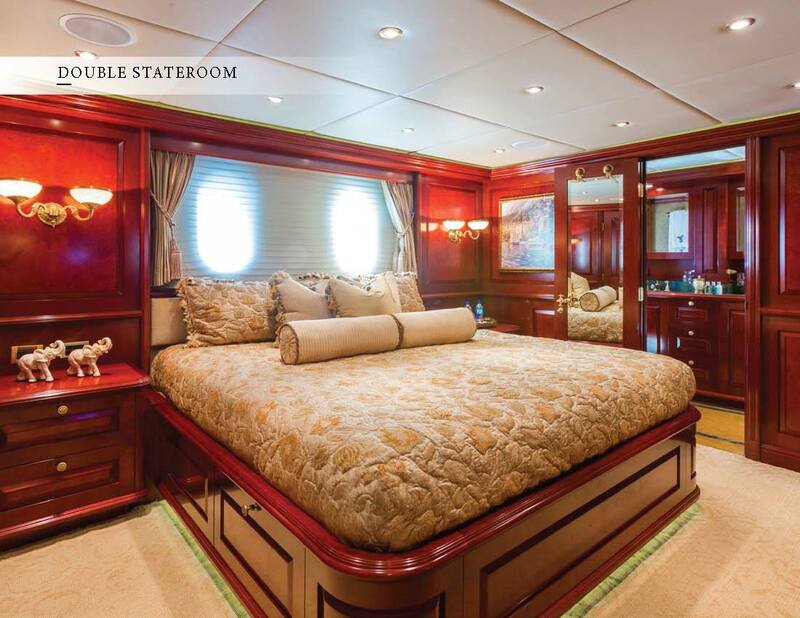 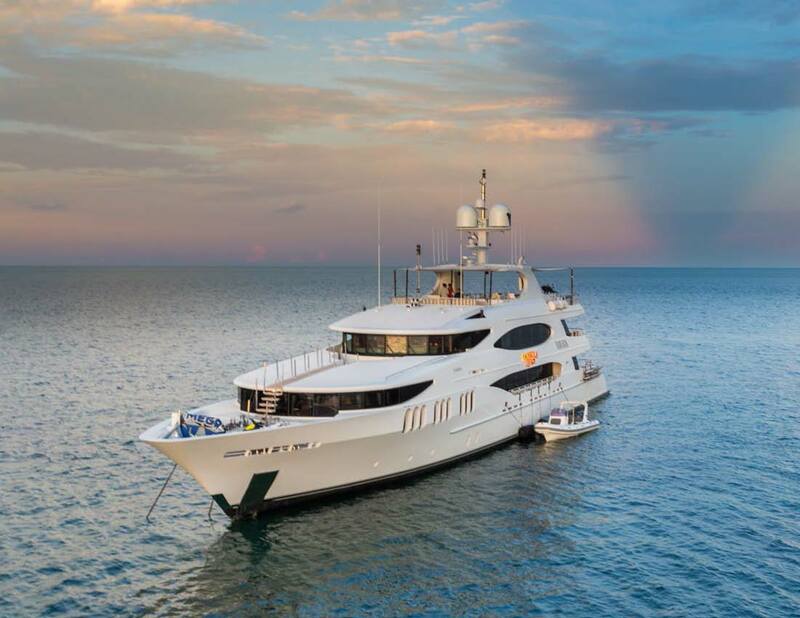 Accommodating ten guests in five staterooms, the main deck master cabin is a dual-level with King bed on the high level facing forward through windows overlooking the bow and a sitting room with television on the lower level. 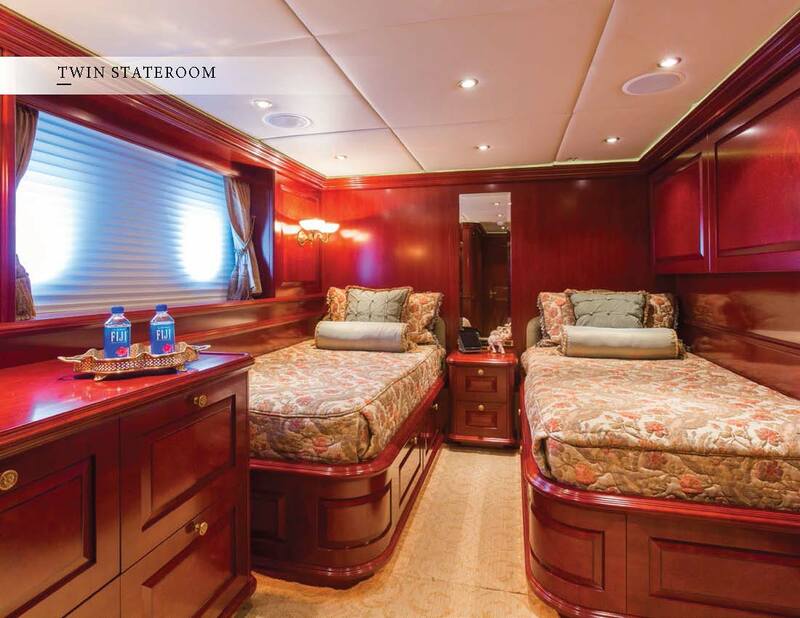 This stateroom has his and her baths with hers having a Jacuzzi tub and his having a glass shower. 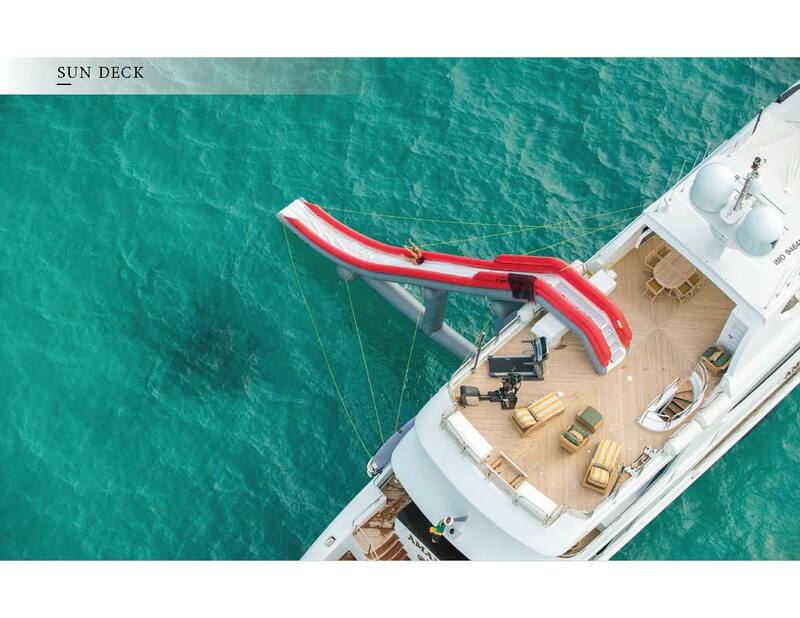 Four additional staterooms are below, two with VIP Kings, one with tub, the other with shower, and two forward….one a Twin with Pullman, the other a King with shower, and all with Apple TVs that stream movies from a phone; every cabin can play something different. 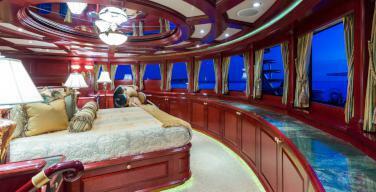 All are high definition TVs, and all have movies on demand as well. 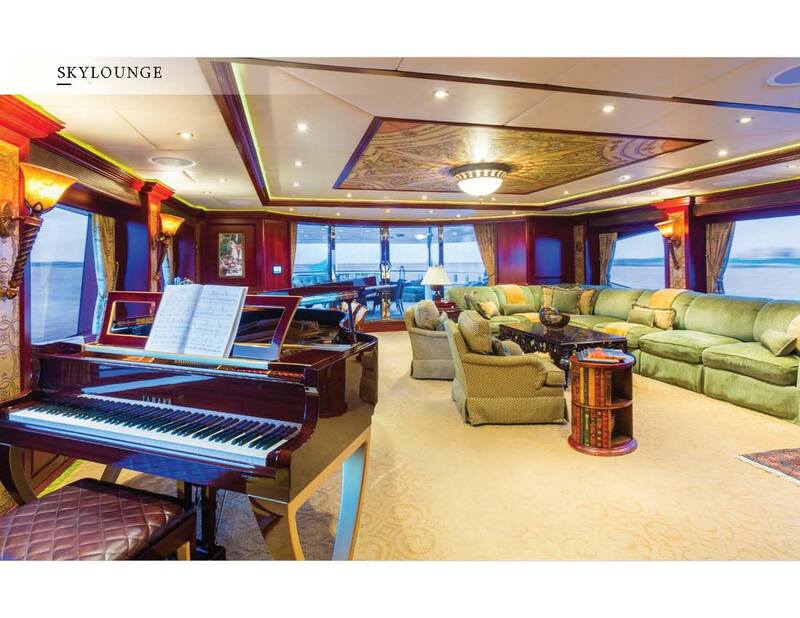 The skylounge appointments are a variation on the theme of the main saloon, only even more comfortable with long U-shaped couch, TV, player piano, marvelous green onyx bar, green brocade couches, fireplace – magnificent! 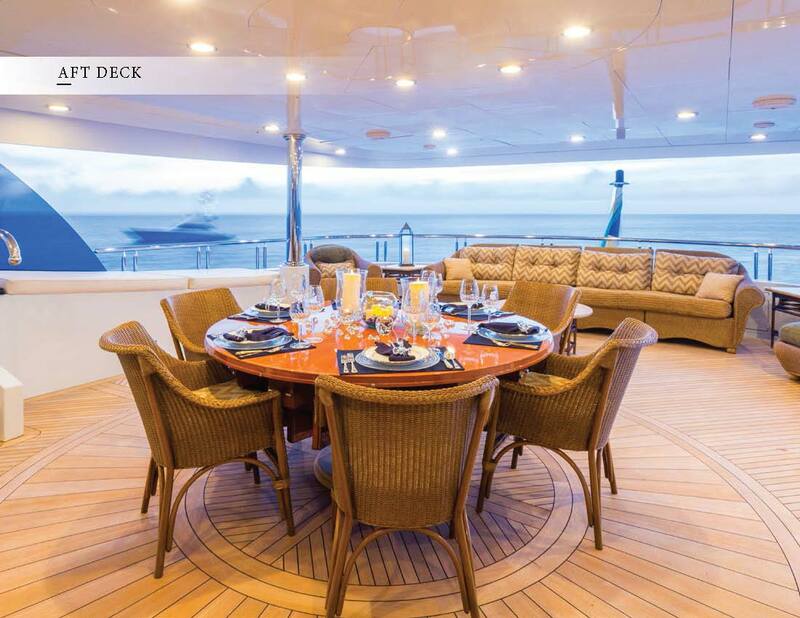 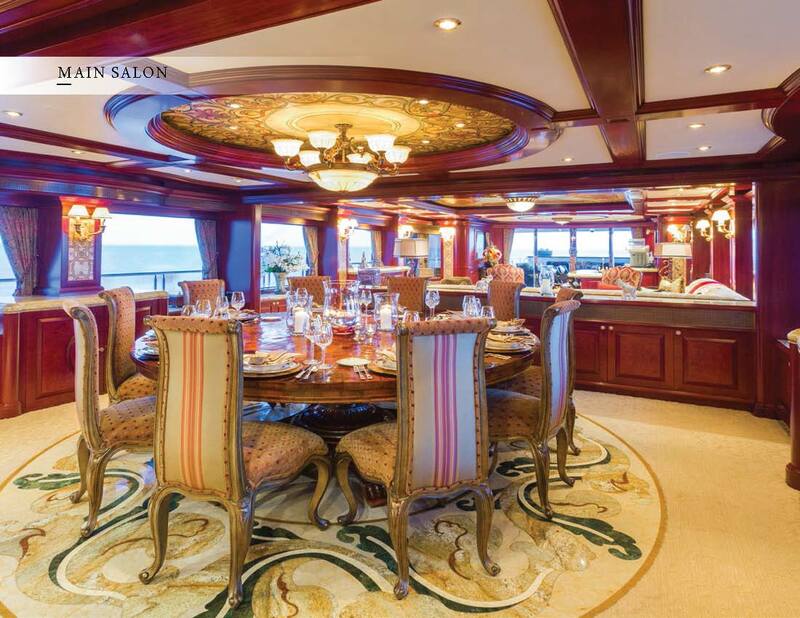 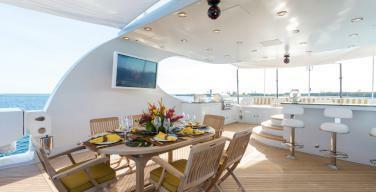 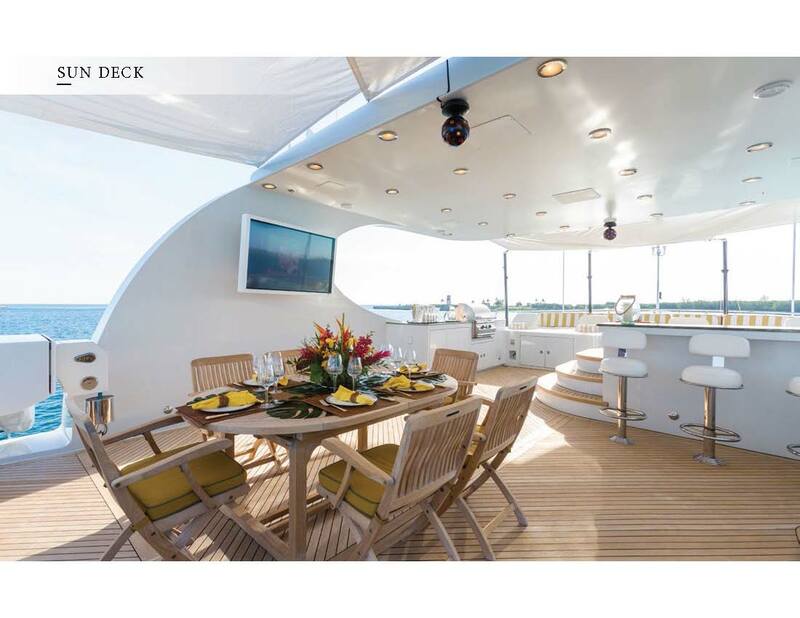 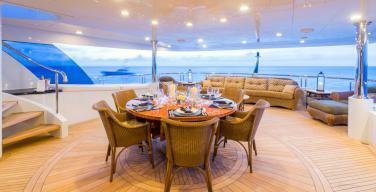 This opens to an aft deck with round dining table, which, as mentioned before, features African themes table settings. 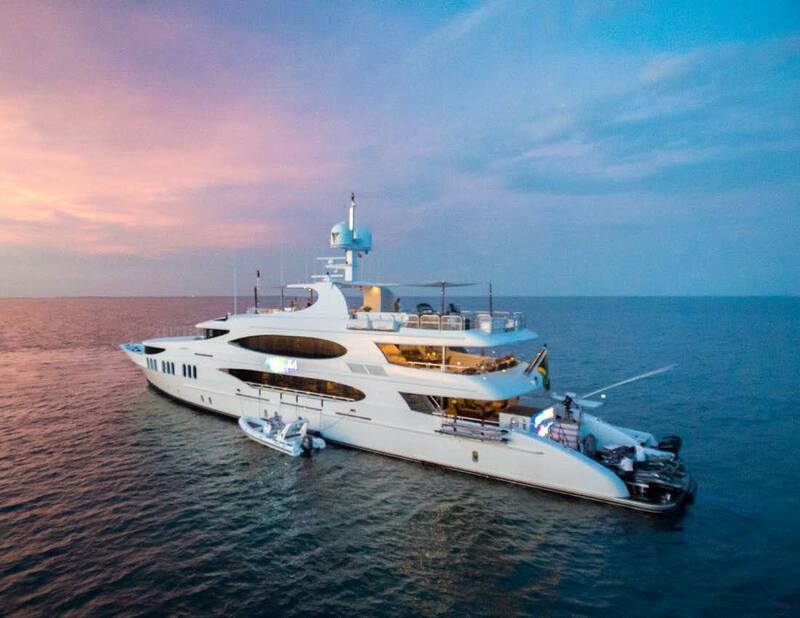 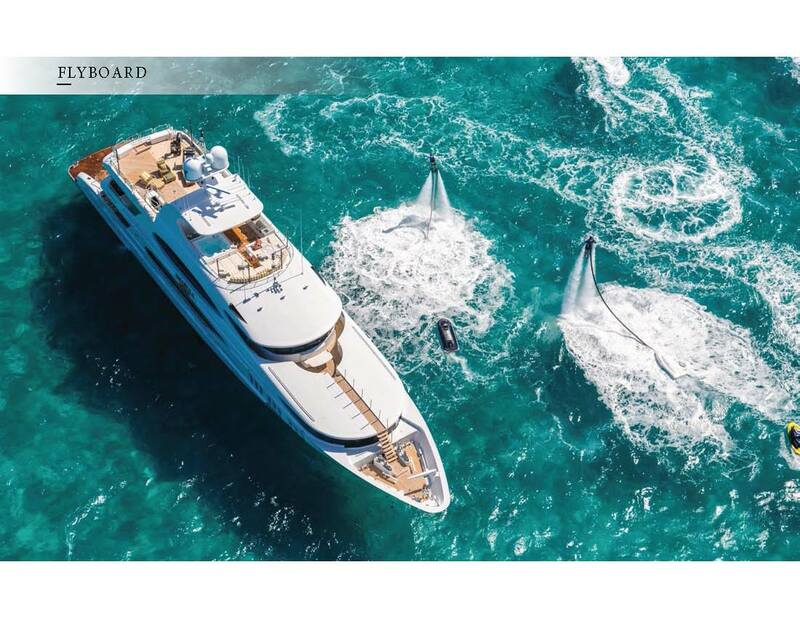 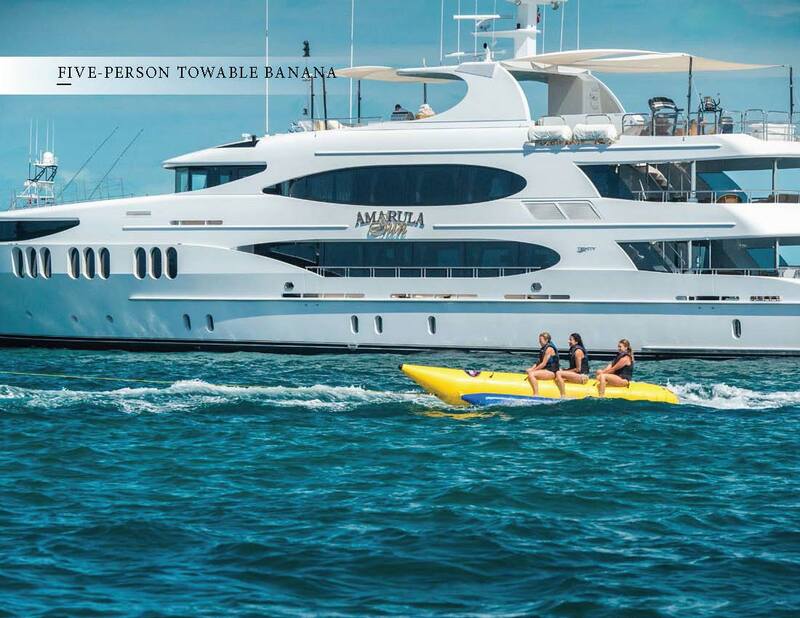 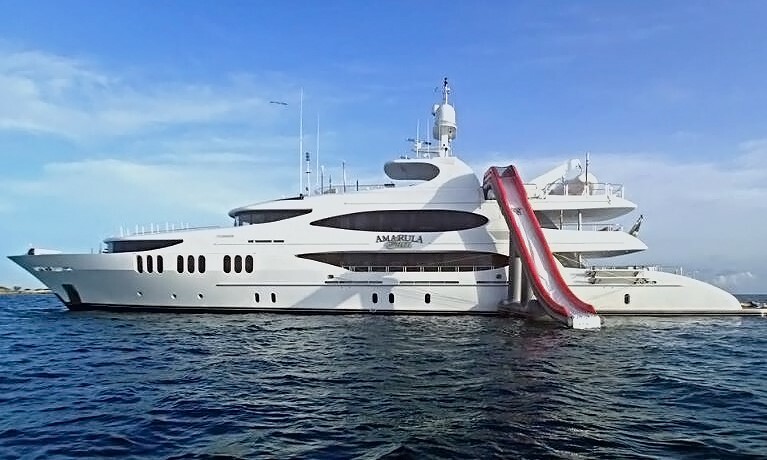 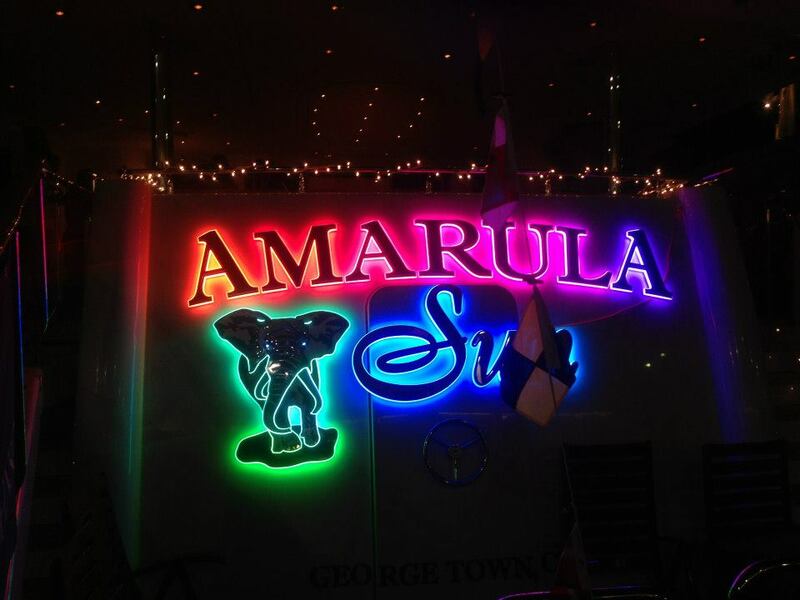 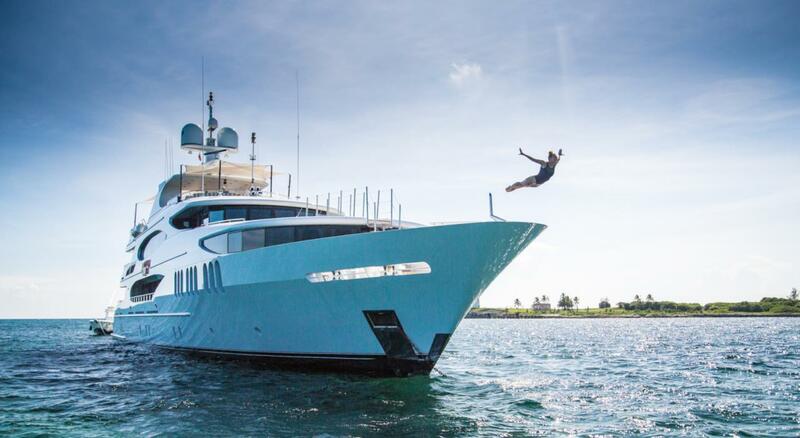 The yacht was named after the Amarula liqueur and uses the elephant logo…. 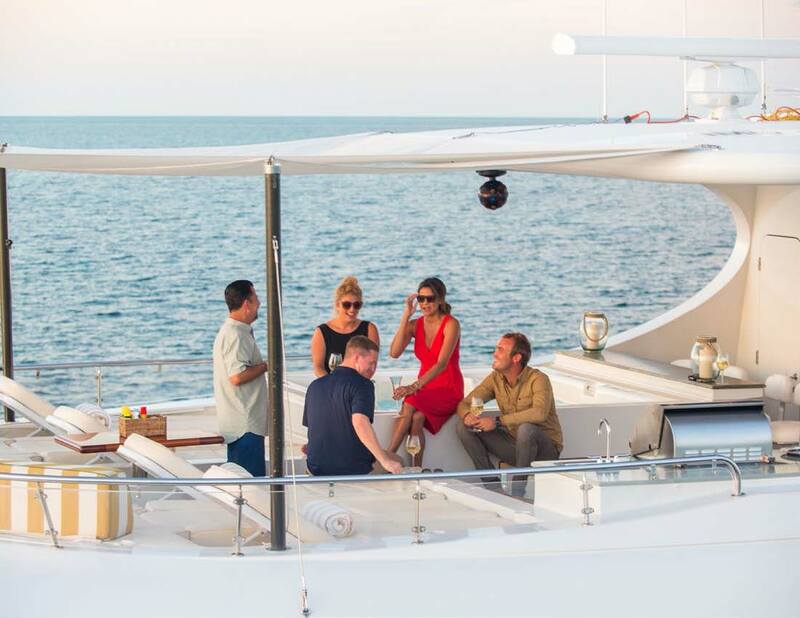 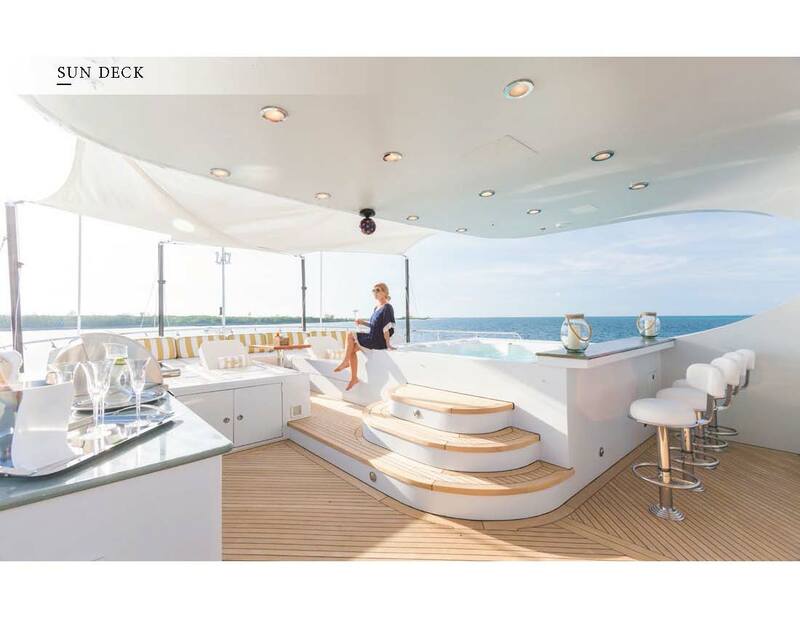 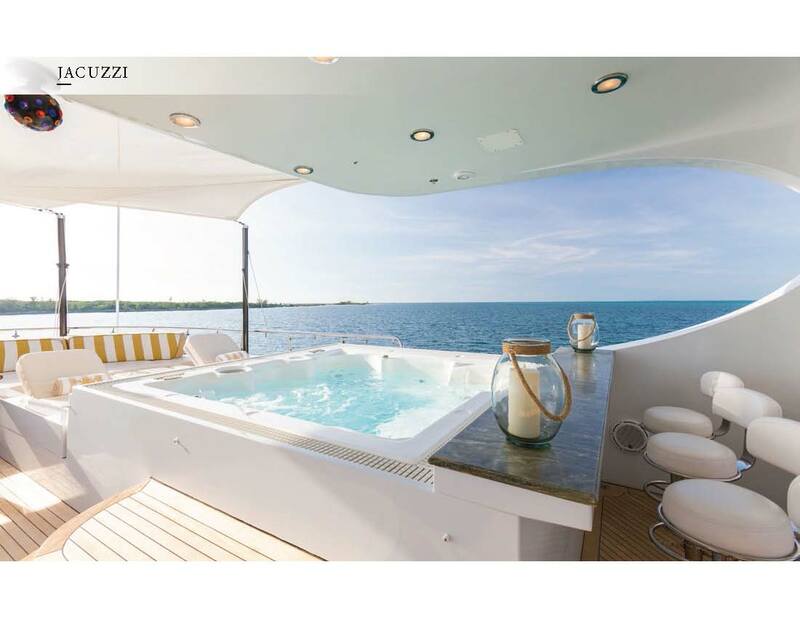 With day heads on every level, the sun deck is really nice and brand new with Jacuzzi with stools and steps, sun beds, dining table, arch for shade, teak decks, barbecue, crane, awning, wicker chaises and television. 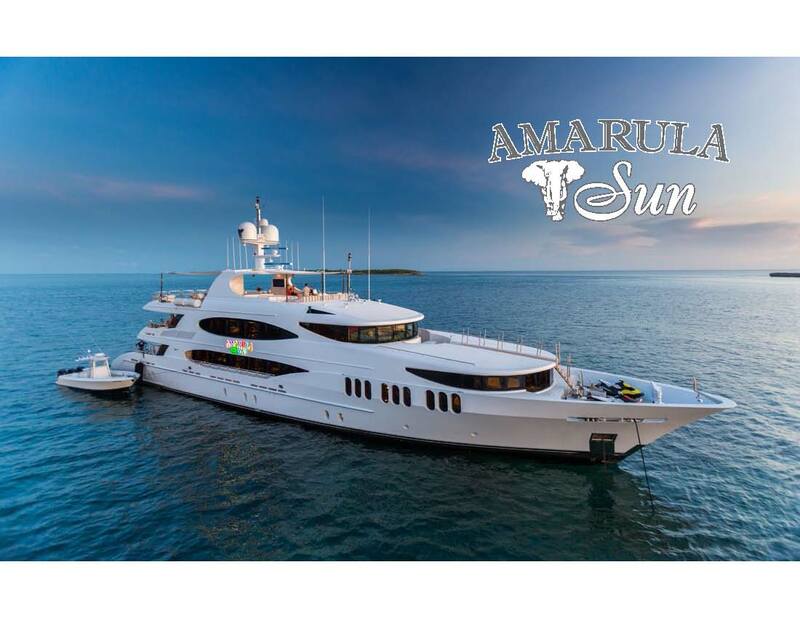 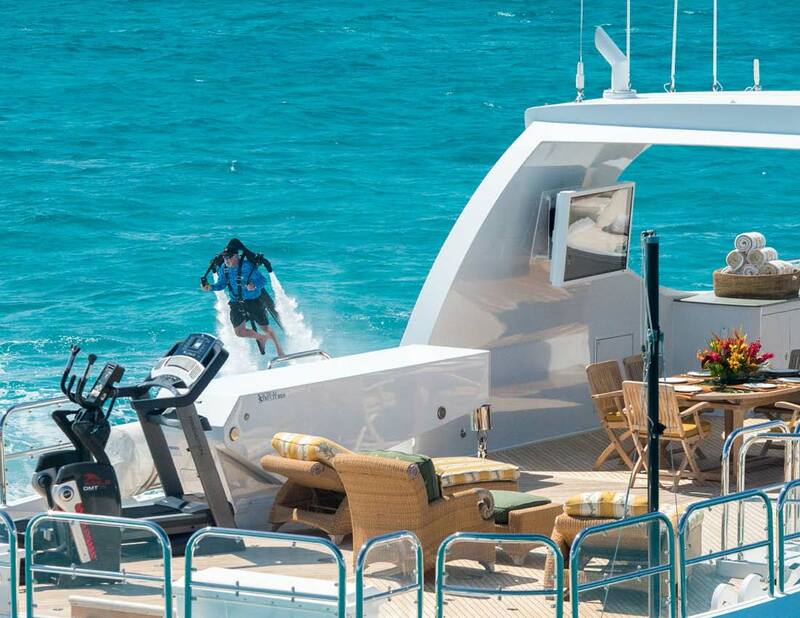 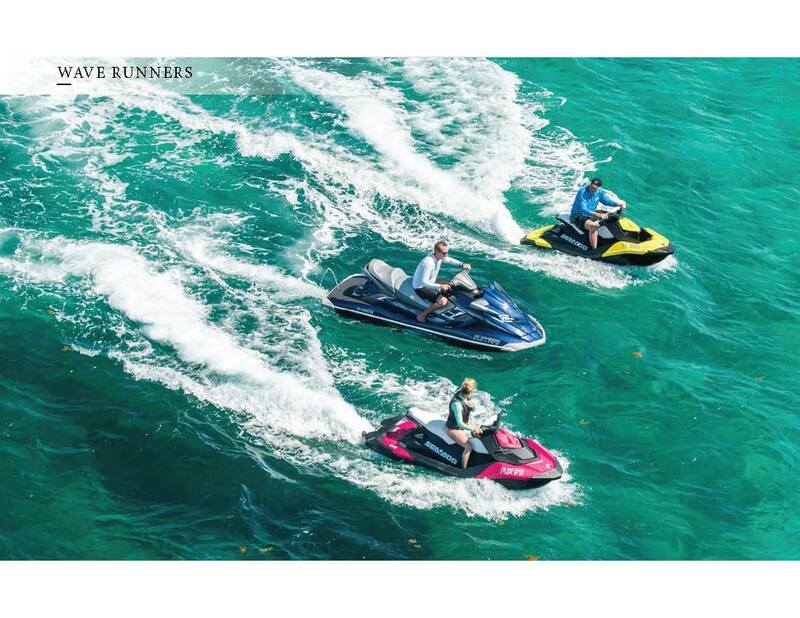 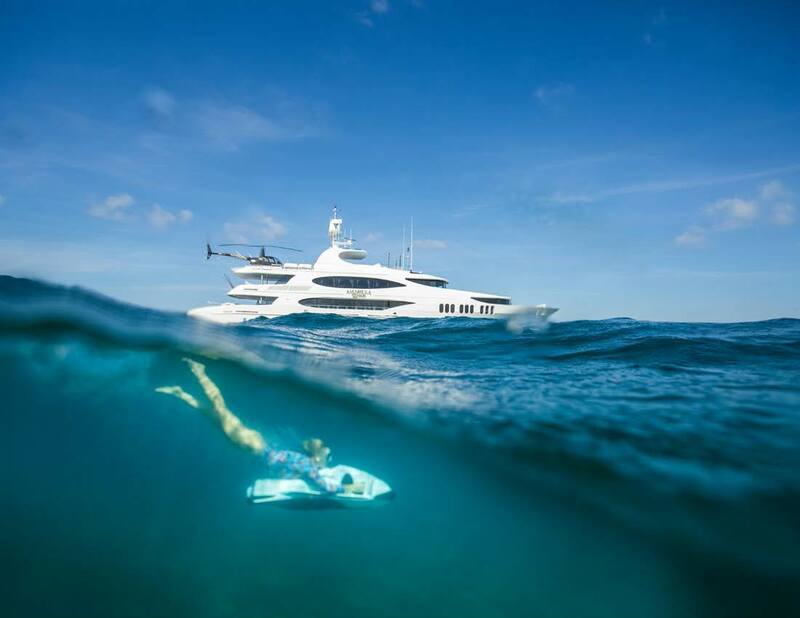 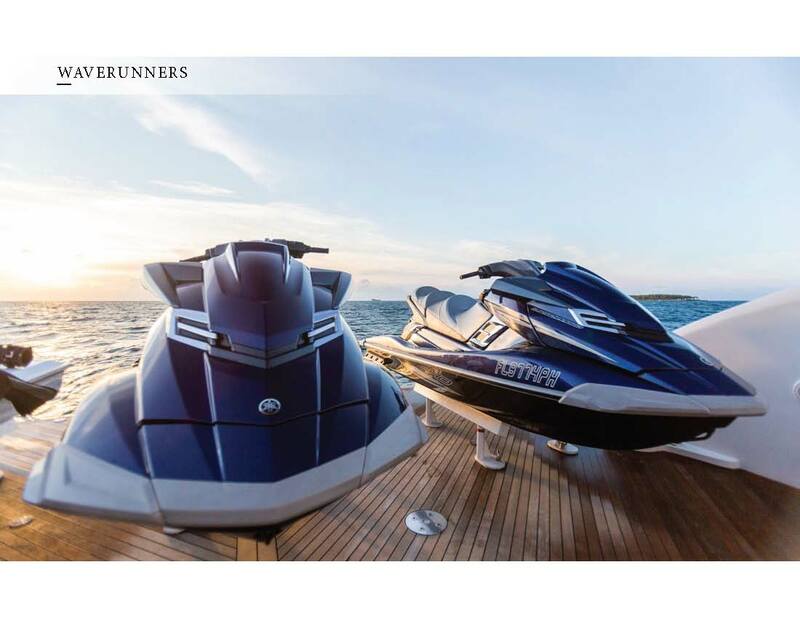 Ideal for families, AMARULA SUN is proud of her sports inventory: wake board, water skis, tubes, beach parties set up, four jet skiis, Jet Lev and Flyboard, stand up paddle board, snorkeling gear, two huge tenders fully rigged for diving and fishing, and kids toys. 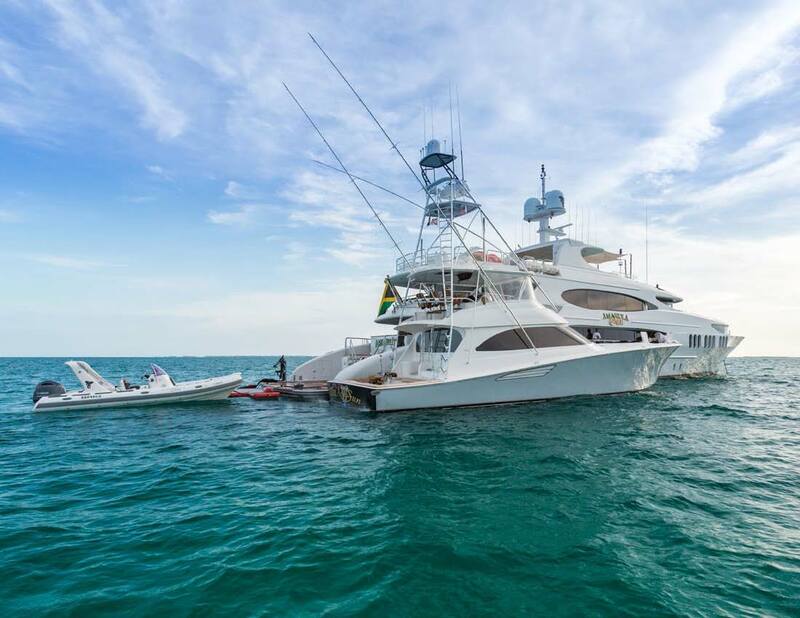 American captain Albert Rodriquez has extensive knowledge of the Caribbean and Bahamas and is assisted by a first officer, bosun, deckhand, chief engineer, three stewardesses, plus chef Craig Kovalsky, an accomplished culinary trained Professional with over 10 years of experience working in high-end restaurants and specializing in farm-to-table cuisine. 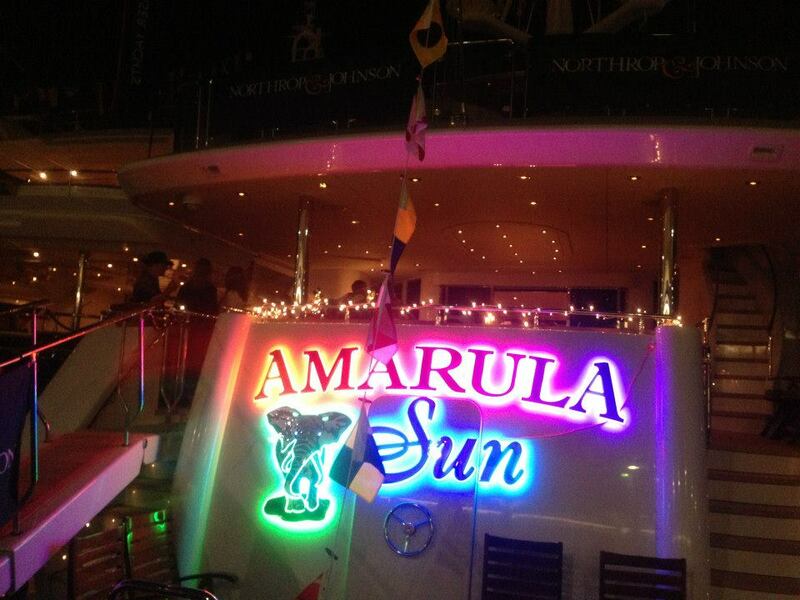 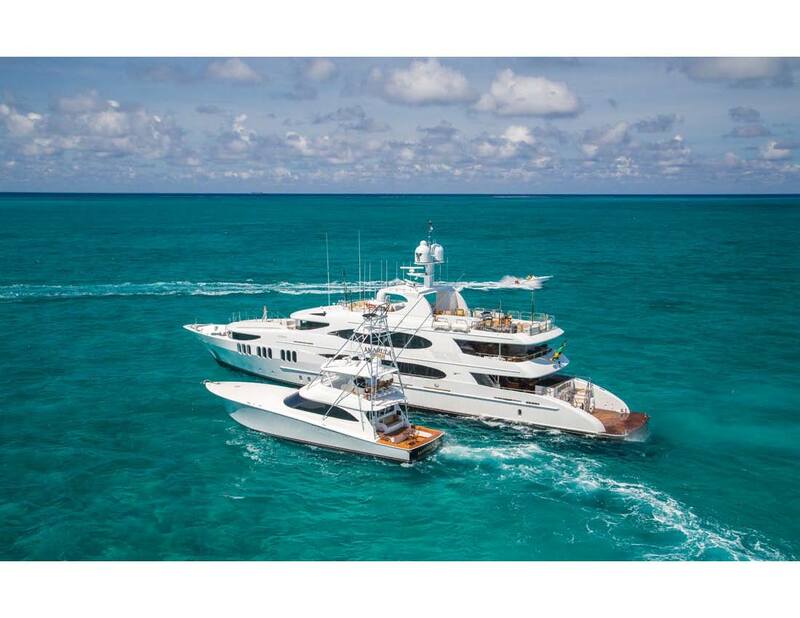 AMARULA SUN is offered for charter in the Bahamas.